Many families with a child diagnosed with autism spectrum disorder (ASD) may not look forward to mealtimes. A child might only eat a specific brand of each food in their diet or might just chew crunchy solids. Or, the child may only eat if he/she can move around the mealtime table. 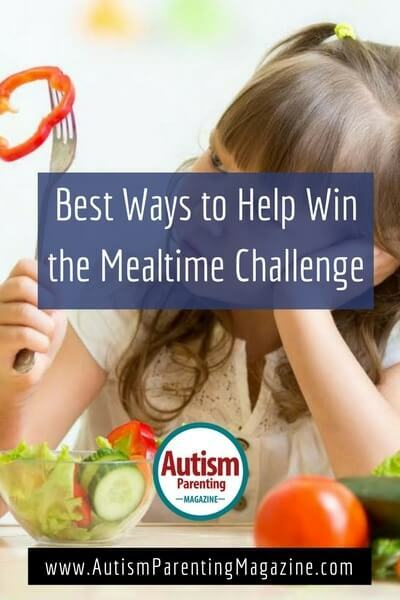 Because parents have a fundamental need to nourish their children in a socially acceptable manner, these behaviors, often seen in children with a diagnosis of ASD, can make meals extremely stressful for the whole family. An example of a strategy, based on information from parents, teachers, and direct observation, would be to begin the feeding program at a table separate from the dinner table with minimal visual and auditory distractions. Many children with a diagnosis of ASD do not process sensory information well, which may cause eating foods to be an unpleasant experience. Sensory-motor based activities can help the child process sensory information through their touch, smell, auditory, balance, and proprioceptive systems. These activities can help to calm, organize or alert the child’s sensory systems. Calming activities prior to a snack or meal might help the child who is over or hyper-responsive to information received through one or more of his sensory systems listed in the previous paragraph. The child described in the initial paragraph, who is in constant movement around the dinner table, would benefit from calming activities. Alerting activities would be helpful prior to a snack or meal for the child who is under or hypo-responsive to information received through the sensory systems. These activities may help the child become more responsive to sensory stimuli presented during the meal or snack. Organizing activities can increase attention and help the child to focus on relevant information for the snack or meal. A stable position in a chair with feet firmly on the floor. The child will then be able to focus on the meal and not whether she might fall out of the chair. A timer. This will let the child see how long the snack or meal will last. Keep a snack to no more than 15 minutes and a meal to no longer than 30 minutes. Utensils that are the appropriate size for the child. Plates that are one color so the child is not overcome by the patterns on the plate. A small lunch plate. A dinner plate may be too overwhelming to the child. Pay attention to the quantity of food placed on the child’s plate. Initially, just a small amount of the new food should be presented to the child. An example of a small amount would be one teaspoon to one tablespoon of the targeted food. Mealtime stress can be reduced for all involved with a child who experience eating difficulties. The strategies and sensory-motor activities listed throughout this article can make for a greater chance of acceptance of a variety of foods by the child in a socially acceptable manner. It is important, however, to understand that the child’s feeding behaviors have typically been occurring over a period of time. It will take time, but change can occur with patience, consistent daily effort, participation by all involved with the child, and a sensory-motor intervention program that is individualized to the child’s needs and developed by a feeding specialist. Escalona, A., Field, T., Singer-Strunck, R., Cullen, C. & Hartshorn, K., (2001). Brief report: improvement in children with autism following massage therapy. Journal of Autism and Developmental Disorders, 31(5), pp.513-516. Flanagan, M., (2008). Improving speech and eating skills in children with autism spectrum disorder. Shawnee Mission, KS. AAPC. Kranowitz, C. (2006) The out -of-sync child. New York: The Penguin Group. Twachtman-Reilly, J., Amaral, S. C., & Zebrowski, P. (2008). Addressing feeding disorders in children on the autism spectrum in school-based settings: Physiological and behavioral issues. Language, Speech and Hearing Services in Schools, 39, 261-272.